The City of Lincoln, Alabama rolled out the Red Carpet for the ladies of the LBAA last week as the tour came to town for stop number two of the 2018 season. The week of events kicked off with angler partnering with the Lincoln Parks and Recreation Fifth Annual Blue Eyed Creek Festival and Kids Fishing Derby. Anglers were on hand to assist and provide support to kids and their adult companions! Everyone was in search of the elusive Albino catfish that had been released as a prize fish! Kids from numerous age groups competed for a variety of honors and fun was had by all. Diane and Bobby Smith, owners of Montana’s Saloon and Grill and Caribe Club and Marina opened their doors and docks to the LBAA for meetings, meals, weigh-ins and entertainment! For ladies staying at the Comfort Inn, the owner provided bags with breakfast snacks, fruit and water each day of competition! Randy Stamps lent his time and photographic skills capturing some great perspectives of the anglers on the water, at the docks and on the stage. It really was an amazing welcome and hosting by so many in Lincoln! When in came time for the LBAA event, it was the first time in a long time, the Lady Bass Anglers Association had overall consistent weather patterns for the Lake Logan Martin event. Most days of practice and the event were mostly sunny with starting temps in the 60’ and days end temps in the upper 80’s. Light breezes on most days made the warmth more tolerable for all of the anglers. Many anglers monitored the water flow patterns by Alabama Power and Light to make moves to various places in search of both largemouth bass and the big fighting Coosa River spotted bass! When the final totals were tabulated Pam Martin-Wells was the district leader of the pack. The weight separating second through sixth place was less than two pounds in the pro division. 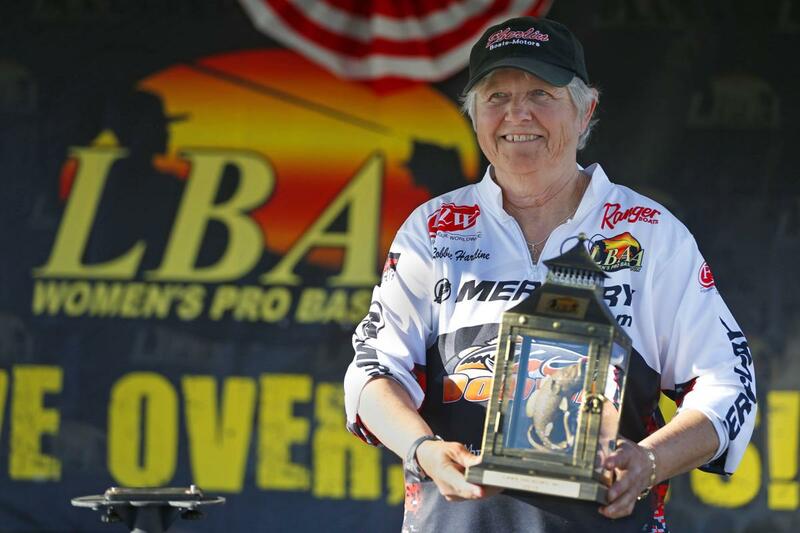 Pam Martin-Wells of Bainbridge, Georgia returned to the LBAA stage after taking a year off to win the Lake Logan Martin event hosted by the Lincoln Parks and Recreation Department. Pam’s winning weight of 23.90 lbs. “I found bedding bass holding up in shallow submerged vegetation during practice and it paid off during the event”, said Martin-Wells. Her two day combined bag bested the rest of the field by just under six pounds. Sitting in second place is Lisa Johnson of Centre, Alabama who targeted mostly post spawn bass. Johnson’s two day bag came in at 18 lbs even. She was followed closely by Mickie Wolfinbarger, the LBAA 2017 Angler of the Year with a two day weight of 17.43lbs. The remaining anglers in the top ten are Secret York (Benton, KY) 17.11 lbs, Monica Altman (Angier, NC) 17.07 lbs, Wendy Kendrick (Walker, LA) 16.80 lbs, Lynda Gessner (Hot Springs, AR) 15.79 lbs, Kim Bain-Moore (Pellham, AL) 15.70 lbs, Debbie Warner (Murray, KY) 15.69 lbs and Penny McCurdy (Gilliam, LA) 15.27 lbs. In the co-angler division, Benton Kentucky Angler Glyn Ellen Valentine took home the top honors brining 14.23 lbs to the scale for her two day total! It is important to understand that in the co-angler division, they are only allowed to bring three fish to the scales each day. Considering that, Glyn Ellen took the lead on day one and never looked back! When asked about the key to her success, Glyn Ellen simply stated that “as a co-angler you have to be able to adapt and count on the pro to put you around fish. I was fortunate enough to have all the cards line up each day and I made the best of the situations before me.” DeAnna Lovvorn of Bradyville, TN, once again showed that consistency is key and this earned her a second place finish with 12.87 lbs. The top ten was rounded out by Dana Rabon (Anyor, SC) 11.04 lbs, Diana Uebelhack (Mt. Vernon, IN) 10.37 lbs, Cindy Adler (Harrison, AR) 9.99 lbs, Denise Hudson (Arkansas) 9.37 lbs, Vanetta Groeteke (Reed Springs, MO) 9.22 lbs, Alisa Johnson, 2017 Co-Angler of the Year (Chandler, TX) 8.81, Robyn Cook (Raleigh, NC) 7.82 lbs and Dana Davis (Alabama) 7.79 lbs. Springer Equipment is the 2018 Big Bass Sponsor! On the Pro-Angler side of the event, those honors went to Pam Martin-Wells with her 4.44 lb big bass brought to the scales on day one. On the Co-Angler side, Alabama resident Veronica O’Neal brought hone the big bass in her debut event. Veronica’s bass weighed in at 3.36 lbs. She kept it quiet from her husband until she pulled the big girl out of the bag on stage for all to see! We greatly appreciate Springer Equipment for sponsoring this award! This event is being brought to the area by the City of Lincoln Parks and Recreation Department, and the City of Lincoln. We are so grateful for the opportunity and support. Without the support of local sponsors this event would not be possible. Special thanks to Montana’s Grill and Saloon, Caribe Club and Marina, Comfort Inn, Springer Equipment Company, Midway Auto Parts of Lincoln, AL, Rozar Paint Supply of Annison, AL Field and Stream of Hoover, AL, Marie Pool of Anniston, AL, O’Reilly Auto Parts of Talladega, AL, Bucks Island Marine of Southside, AL, Darlaine Wheels (Mary Kay) of Talladega, AL, Lincoln Hardware of Lincoln, AL, Partners By Design of Pell City, AL and Randy Stamps. The LBAA tour sponsors are: HiTech Outdoors, Donely’s Marine, Clay Maxey Ford, Picky Vicki’s, Flat Out Tungsten, Bass Addiction and our most recent addition Fin and Feather Resort. The next Lady Bass Anglers Association event will be the Wildcard Event on Kentucky Lake June 21-22, 2018. Come join in the fun and be a part of something exciting in the world of Women’s Professional Bass Fishing! To view the event photos, please visit the LBAA Facebook Page. For more information on the Lady Bass Anglers Association, please visit our website at www.ladybassanglers.com. From there we invite you to follow us on Facebook and Twitter and subscribe to the Lady Bass Anglers Association You Tube Channel!